Keep up-to-date with the latest related news and features about Egyptology, modern and Ancient Egypt. 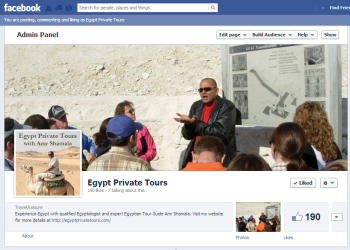 Find out the latest travel information and news on our historical sights and ancient Egyptian antiquities and artefacts on our ‘Egypt Private Tours Facebook‘ page. We post daily since things change so frequently, with exciting new discoveries and finds happening all of the time; as well as news of great exhibitions opening and continued sight and museum improvements and developments. ‘Like’ us on our Facebook page to stay in touch.